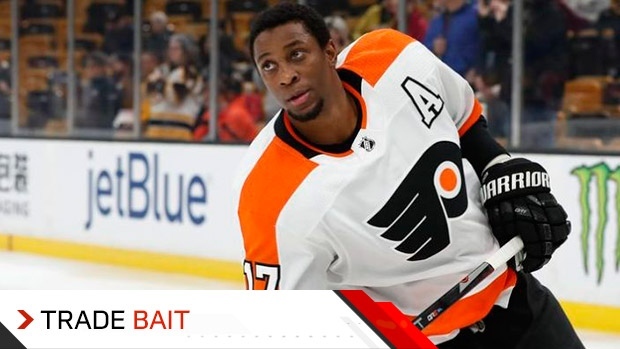 PHILADELPHIA - There is a conclusive conversation to be had in the next handful of days between the Philadelphia Flyers and the Wayne Simmonds camp to determine his destiny. Up until now, the only way to glean insight into Simmonds’ future has been to interpret what hasn’t been said. The belief is that under new GM Chuck Fletcher, the Flyers haven’t made an offer to keep Simmonds and extend his contract. Fletcher may circle back to the Simmonds camp next week and make a last-second pitch if the offers from teams aren’t up to snuff. He will also need to juggle where the Flyers sit in the standings and whether Simmonds makes sense to keep as an “own rental.” The Flyers currently sit eight points back of Pittsburgh for the final wild-card spot and do not own any of the tiebreakers. Right now, all signs still point to an amicable breakup over the next 10 days. Simmonds is No. 4 on the latest TSN Trade Bait board. The respect Fletcher and the Flyers have for Simmonds is clear. Simmonds is a beloved figure in the Flyers’ organization and throughout Philadelphia. There hasn’t been any pretense. Simmonds, 30, said the mood around the team has “loosened up” since they’ve reeled off points in 11 of their last 12 games to claw back into the playoff race. Numerous teams have reached out to Fletcher with significant interest in Simmonds. He is the rugged winger who can provide both muscle and scoring touch for a playoff run. The Tampa Bay Lightning, Winnipeg Jets, Nashville Predators and Boston Bruins are believed to be interested. The Scarborough, Ont., native would also be a prime fit with the hometown Toronto Maple Leafs, though GM Kyle Dubas is on record as not being wild about rental additions. Last season cemented Simmonds’ status as the ultimate warrior. He played through a fractured ankle, torn groin, a tear in his hip and a broken jaw. The only thing that kept him out of the lineup for seven games was a torn ligament in his thumb. He still managed to put up 24 goals and 22 assists for 46 points in 75 games. This season, Simmonds has 16 goals and nine assists for 25 points in 57 games. He said he is finding his stride again after undergoing four significant surgeries last summer to correct those previous injury issues. “It takes time,” Simmonds said. Until a resolution is reached one way or the other, Simmonds said he will block out the noise and concentrate on helping the Flyers try to pull off a run that no team in the history of the NHL has managed. No team has been 16 points out of a playoff spot, like the Flyers were in early January, and gone on to qualify for the postseason. If nothing else, Philadelphia’s last game before the trade deadline – the 2019 Stadium Series against the Penguins outdoors at Lincoln Financial Field – may be the perfect send-off for Simmonds, a celebration of a player who was seemingly born to be a Flyer.